Kids' Book Review: Review: Can You? Rod Campbell has an appealing abundance of books, most of which seem to take a back seat to his best-seller, Dear Zoo. Whilst Dear Zoo seems to be tucked into every corner of every baby and toddler-centred facility (with good reason), Campbell has far more to offer! Which brings me to my book du jour. Can You? is simple yet effective in engaging the little one who is new to books. If you are looking for a book which is a small step above word-per-page concept books (eg. hat, ball, bib etc. ), then this is the book for you. Can You? is a touch and feel book. The story follows a baby as he or she undertakes simple tasks, such as opening a present and playing peek-a-boo. The narrator wants to know; 'Baby can do XYZ. Can you?'. 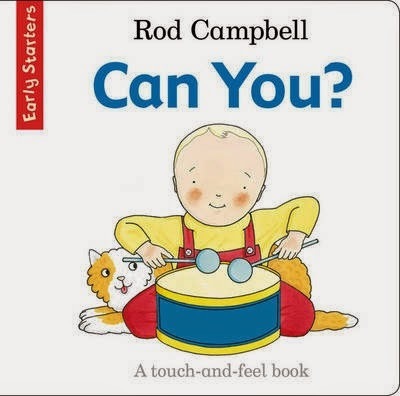 I'm pleased to report that, thanks to this book, my son (19 months) has been asking 'Can you'? from a very early age. What more can a mother ask for? This book is derivative of the Pat the Bunny books, by Dorothy Kuhardt, but less gender division-y and a lot more contemporary. I recommend this one without reservation. My son has been enamoured with this book for about eight months now and shows no sign of retiring it any time soon. I went out and bought this book. Can you?